Black soap tackles household chores, garden bugs, floors, and more, but you can also use black soap for pets. Marius Fabre black soap can be used as a natural shampoo for animals. The soap gently cleans and adds shine to coats while also preventing skin conditions such as eczema. It also has been shown to prevent parasites. 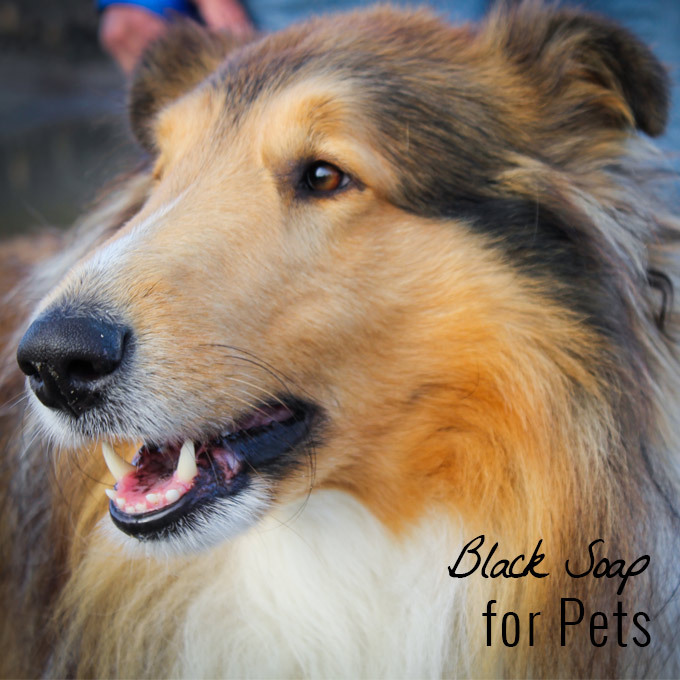 Thoroughly wet your pet and apply one or two dabs of black soap. Lather and rinse completely. To use as a parasite treatment, lather and leave the soap for a few minutes and then rinse thoroughly. 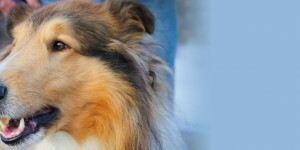 In addition to using black soap as a pet shampoo, it is also a good soap to use for cleaning kennels, mats, pet beds, and more. 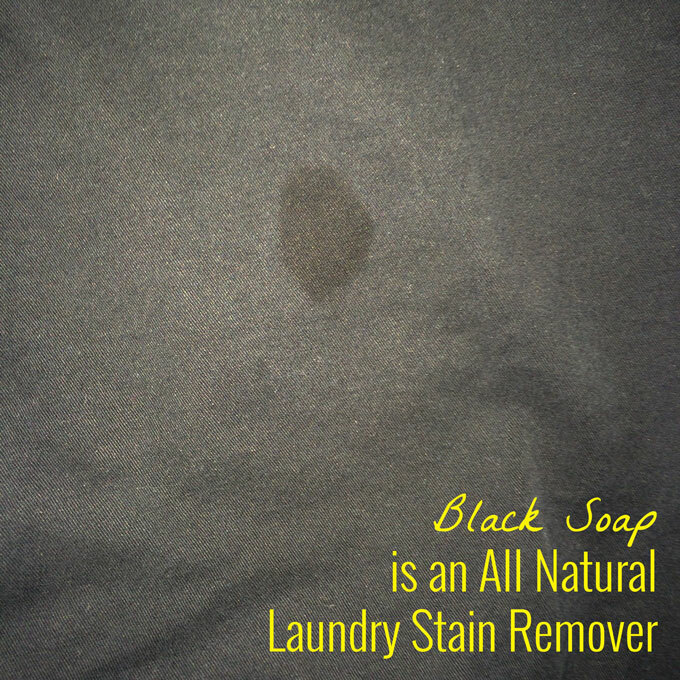 Black soap is an all natural laundry stain remover. I was surprised when I read this in the materials from Marius Fabre. Their instructions state that black soap can be used both as a traditional detergent as well as a treatment for tough stains. I decided to put black soap to the test with a stubborn grease stain on a pair of black shorts. I also tried it on a toddler’s fully stained t-shirt. 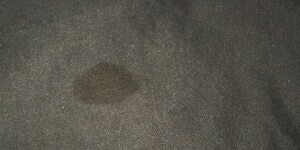 First up was the toddler t-shirt with several greasy looking stains. I tried spraying a mixture of water and black soap from a bottle (basically the multipurpose spray) on the stains. I left the t-shirt to soak for several hours to overnight and then washed with our regular detergent. The result was faded stains, but they were still there. When looking back at the information from Marius Fabre, it says to apply soft or liquid soap directly to the stain, so I decided to try again. This time, I tried treating a grease spot on the front of some black shorts. I noticed it when I was folding the shorts straight out of the clean laundry, so they had already been washed. I figured the stain was set, so I slathered a bit of liquid black soap right on the stain and threw the shorts back into the laundry pile. I washed them regularly a day or two later. There is not even a hint of the stain left on the shorts. It is entirely gone. Since Marius Fabre black soap is vegetable-based and made with olive oil, it’s an all natural and biodegradable soap that can be used with confidence around the home, kids, and pets. As we’ve talked about before, black soap can replace a multitude of household cleaners. With a single base, you can replace your window cleaner, your multipurpose cleaner, and more. Mixed with water in a spray bottle or a bucket, black soap can be perfect for cleaning your windows. 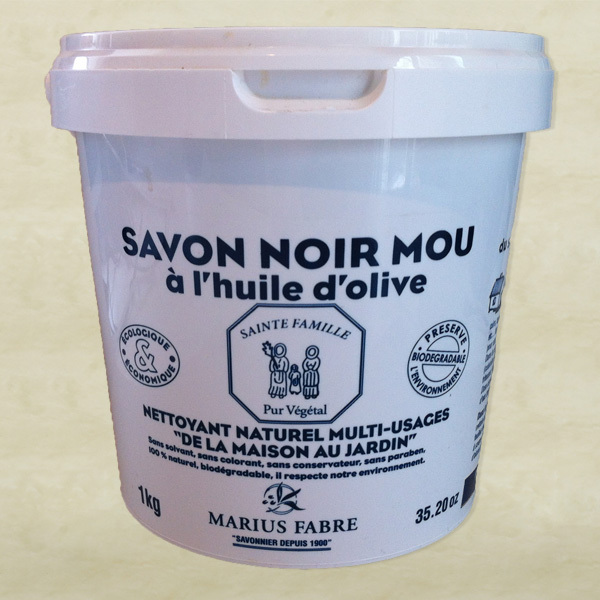 Made from pure olive oil, Marius Fabre black soap, or savon noir mou, is an all natural household cleaner. To begin, gather an empty spray bottle or bucket, black soap in liquid or paste form, water, your favorite essential oil (optional), and a microfiber cloth or squeegee. Mix 1 teaspoon of black soap to a quart of warm water in a spray bottle or bucket. Mix or shake to dissolve the soap. To use, all you have to do is spray or sponge onto windows and wipe or squeegee clean. You should be left with a clean and bright window or mirror. What we like to simply call black soap has had a long history in the south of France. 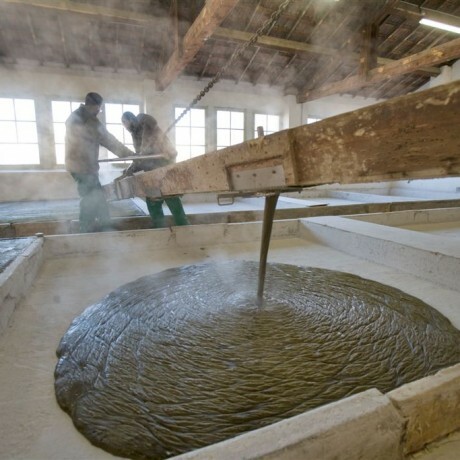 In 1900, a young man named Marius Fabre started making soap in his garden shed in the French city of Salon-de-Provence. At the time, Salon-de-Provence was a commercial center for many types of soap, oil, and coffee. During World War I, Marius Fabre left his wife in charge of running the business, which she did successfully for 4 long years during the war. In the late 1920’s, Marius Fabre moved the company to the facilities it still resides in today. Throughout the twentieth century, Marius Fabre faced many ups and downs as times and technology changed, but through each generation of family leadership, the company pushed through the tough times and remained a reputable and trusted brand in the soap industry. Today, Marius Fabre’s great granddaughters lead the generations-old company in making soap the same way it was made over a century ago. 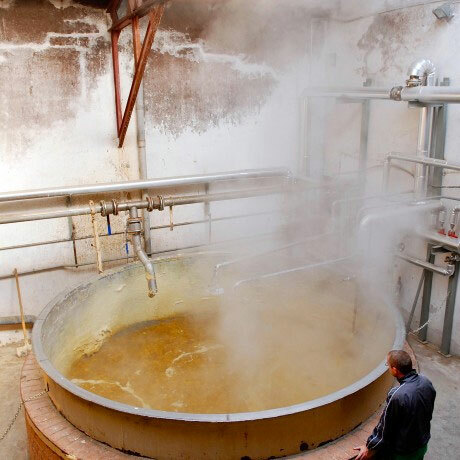 The family has a passion for making true Marseilles soap and are proud to carry on the traditions of their parents, grandparents, and great grandfather, Marius Fabre. 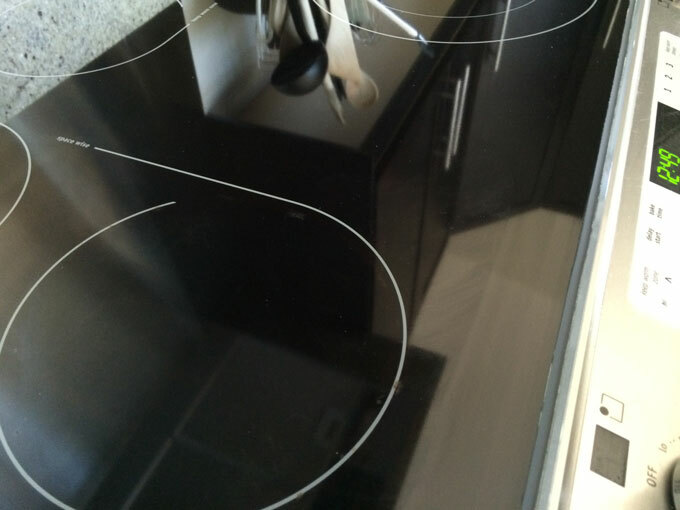 Recently, our glass cooktop needed to be polished and cleaned. There was dried-on pasta water and a few other cooking remnants. I was about to pull out our commercial stovetop polish, but instead decided to try my soft black soap paste. 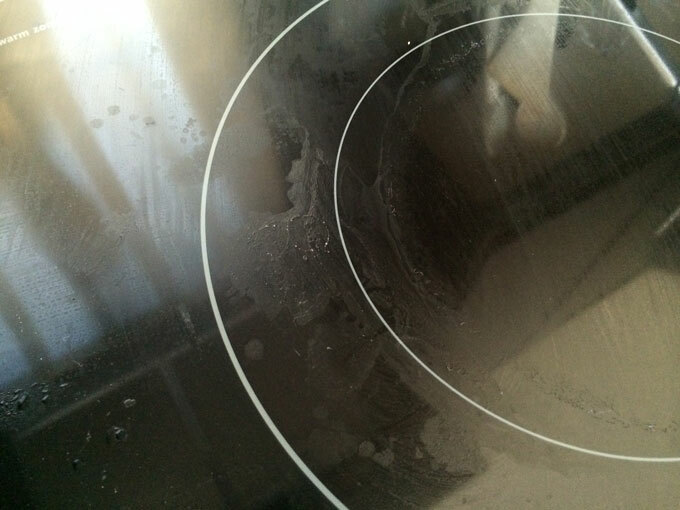 It wasn’t the worst condition our stove has been, but clearly we had made a bit of a mess cooking. 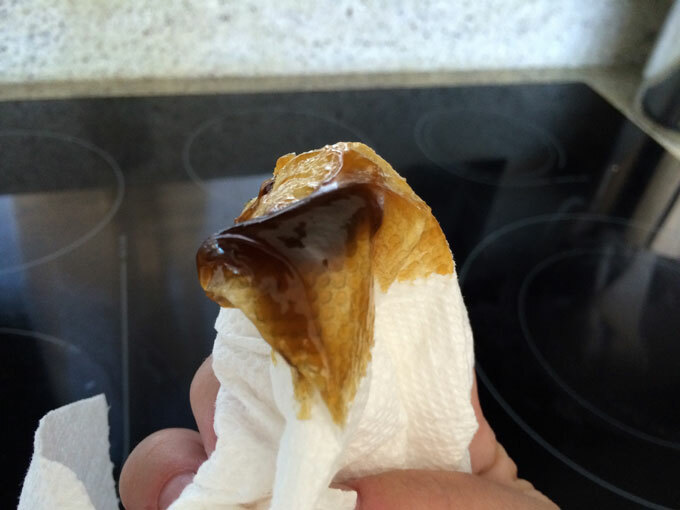 I took a paper towel, dipped it in the tub of soft black soap paste, and started spreading it on the stovetop as I would the traditional polish. I did a little extra scrubbing in the particularly dirty parts. Then I took a clean paper towel and wiped off most of the black soap. I should have used a reusable microfiber cloth, but I didn’t have any clean ones handy. Once I wiped off most of the excess so just a little was left, I took a wet cloth and did a final cleanup and polish. The result was that the black soap paste did a pretty good job. I’m not sure I’m ready to get rid of my stovetop polish, which does a particularly good job on the tough, caked-on stains, but for the day-to-day stuff, or if I run out of my usual stuff, I think I will stick to black soap. It’s all natural and olive oil based, which makes me feel much better about using it than big commercial cleaning products. 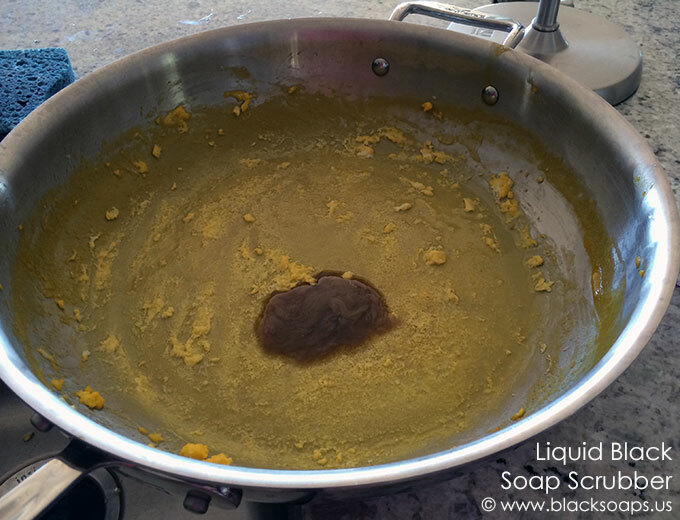 Have you tried black soap as a cooktop cleaner? Please let us know how it has worked for you. 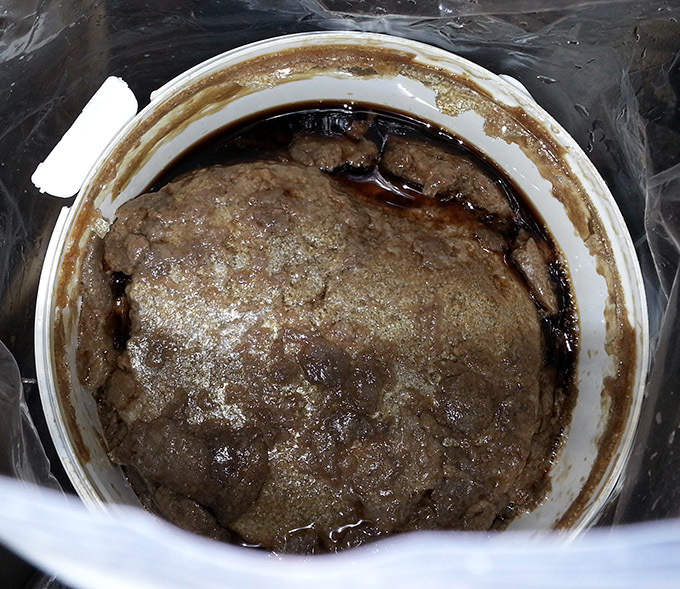 The texture of soft black soap paste can vary from batch to batch. Typically, it has the appearance of a soft black soap paste, sort of like glue paste that you may have used in school. Occasionally though, it may start to separate and even have a seed-like appearance. We have consulted Marius Fabre, the manufacturer, and they have assured us that this can be perfectly normal. Sometimes the paste can separate causing chunks. Their recommendation is to stir the paste back to a consistent texture. Additionally, the smell can seem a little stronger than usual. A customer recently wrote us with his notes on bringing the soap back to its normal texture. He found that stirring it alone did not help return the soap to its usual form, so he tried heating the soap, which worked perfectly. We want to thank Kevin for sharing his technique with us. These steps can be adjusted for your needs and how much soap you will be using at a time. 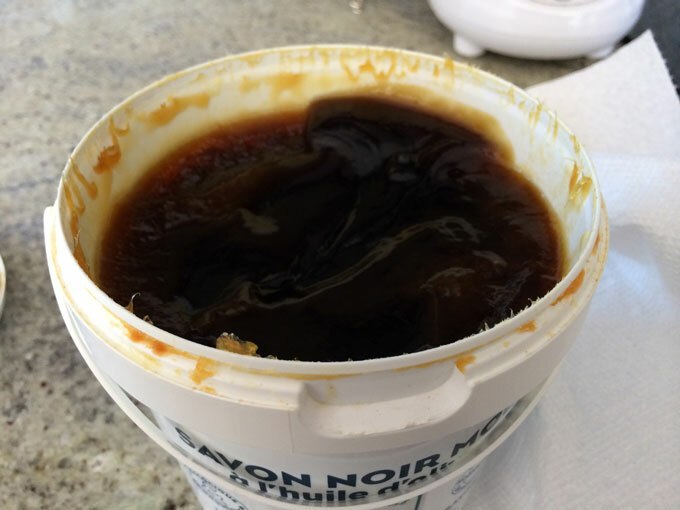 Please let us know if you have any other tips for reconstituting the soft black soap paste if it separates over time. As we’ve mentioned before, one bottle or tub of Marius Fabre Black Soap can replace several bottles of typical household cleaners. While we’ve found that using black soap as an everyday dish soap doesn’t necessarily leave us with the same squeaky clean feeling that regular dish soap does, we have found that it works really well as a scrubbing or degreasing compound. 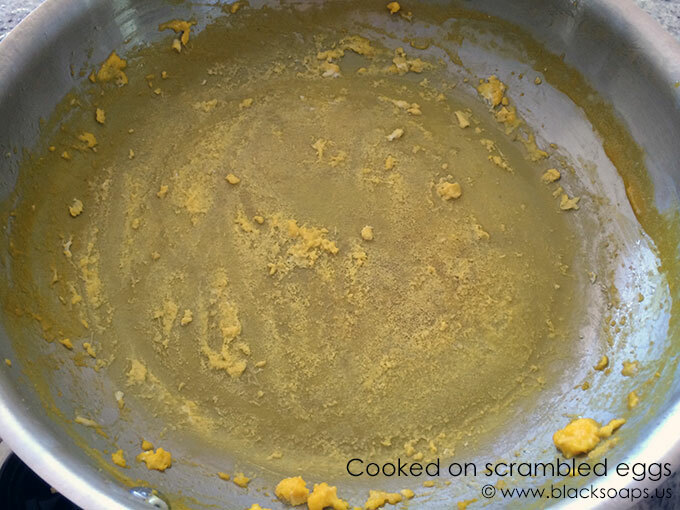 Recently, I made a large pan of scrambled eggs. Apparently I didn’t use enough oil or butter because egg got cooked onto the bottom of my pan. What a mess. Normally I would soak the pan for a couple of hours and then use a pan scraper to get rid of some residue before using my sponge and soap. Well, we were headed out of town and I needed to get the pan washed and put away before we left. I added a dollop of liquid black soap to my sponge and started scrubbing. The cooked-on egg came off quite a bit easier than if I had just used soap. I can also recommend using a small scoop of soft paste and rubbing it in with a sponge or paper towel. In either case, the elbow grease needed to clean the pan is less than using traditional soap. I followed up with everyday dish soap and dried as usual. Don’t know where to start? Want an all-natural all-purpose cleaner for the home? Tired of bottles of chemicals everywhere? Making a multipurpose or all-around cleaning spray is the easiest way to add black soap to your cleaning arsenal. 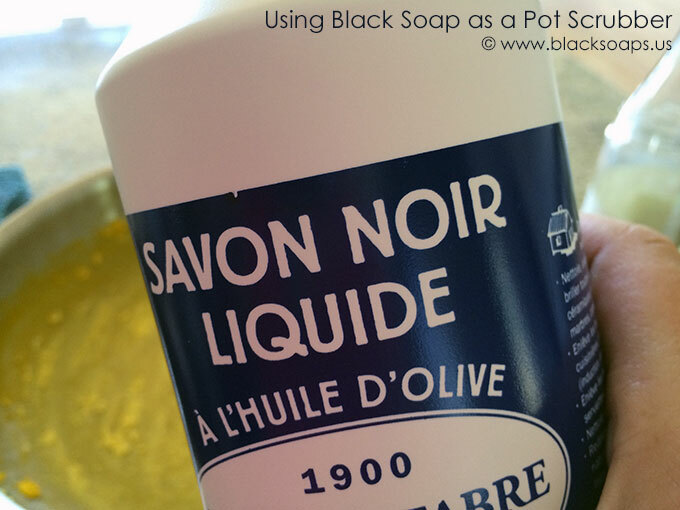 Made from pure olive oil, Marius Fabre black soap, or savon noir, is the perfect addition to a home that’s trying to move towards all-natural cleaning products. Add 1 teaspoon of black soap paste (or a touch more if using liquid) to a quart of warm water in a spray bottle. Add a several drops of your favorite essential oil. Let it sit until it dissolves and then give it a shake to mix. 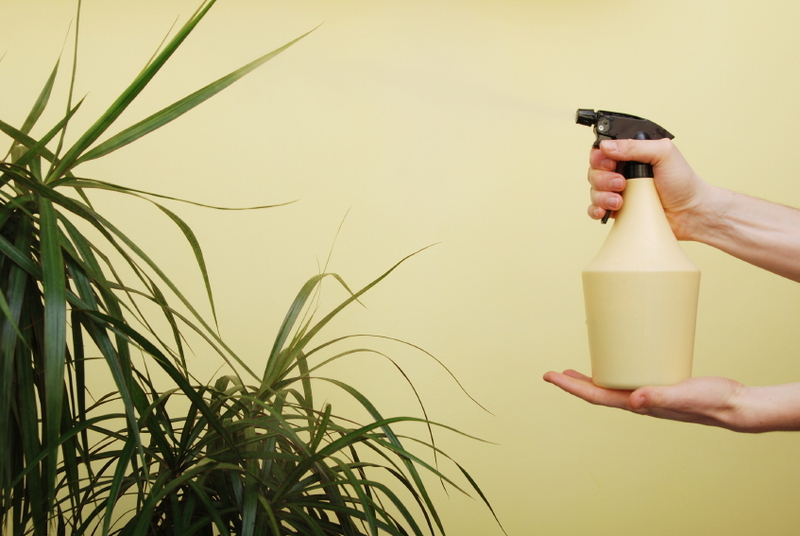 Use as a multipurpose spray around your kitchen and home. May need occasional shaking to remix. *Note: if your water is hard or has many minerals, consider using distilled water in your solution to keep minerals from building up on surfaces. Plants such as fruit trees, rose bushes, and house plants often benefit from being cleaned, most notably to rid them of sooty mold. 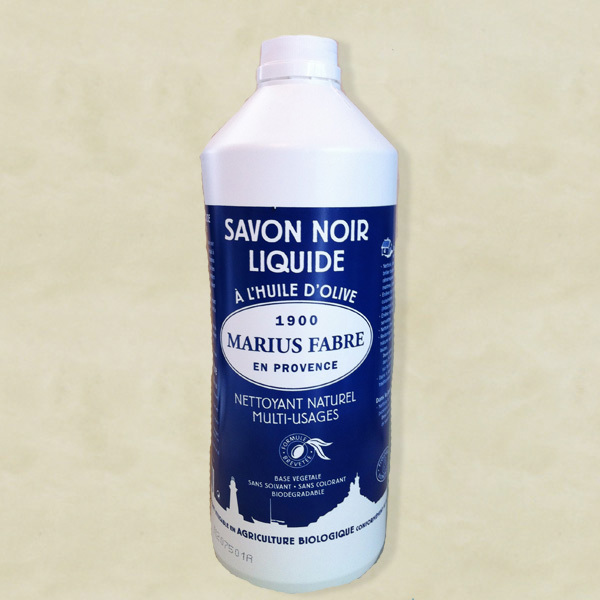 Marius Fabre black soap can be an all natural cleaner for the garden. Making a solution of black soap mixed with warm water and spray or wipe the cleaner onto the leaves of your trees, bushes, or house plants to restore luster and life to your plants.